On January 8, 2009, I began a heartbreaking lifelong journey that those reading this column are probably all too familiar with. On that day, my younger daughter, Ava, passed. 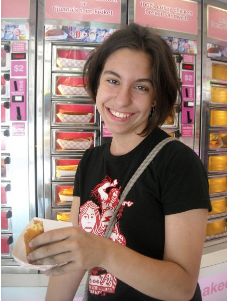 Ava was a senior at Stuyvesant HS, a poet and a visual artist with a most generous heart. Though those of us who have lost a child have a commonality that we instinctively understand, our particular journey through grief is unique, just like our children are unique. I remember early on participating in a COPE group when one mother with a recent loss of a young child spoke about her great desire and need to move. That didn’t resonate with me at the time because my greatest comfort was to be in my home. Some things don’t change, and some things do. In December 2014, I moved to Washington Heights in Manhattan from the apartment in Queens where I had lived with my 2 daughters, Ava and her older sister, Elena. I love living in Washington Heights! I got rid of my car and I live one block from a subway. The commute to my job in the Bronx is reasonable enough, it’s easy to get downtown and take advantage of the city, and I feel less isolated because I now live in a friendly apartment building. Those are some perks that accompanied my move, but I didn’t move for any of those things. I moved because I felt Ava was getting lost in that apartment in Queens, and I was beginning to drown there. Ava’s bedroom door stayed closed because I was fearful my cats would go in there and destroy something. I didn’t want to move anything in her room because doing so seemed like it would be betraying her privacy. And anyway, emotionally, I couldn’t make any changes. In that apartment it was still 2009, and hence Ava was stuck in 2009. I moved to bring Ava out of the bedroom and let her accompany me in the present. So now, for example, her fencing bag, that stayed in a corner of her bedroom, is in a corner in my living room- in my living space. And in my new apartment I was able to hang some of her artwork, which I couldn’t get myself to do in Queens. I believe Ava’s presence is much greater here and she is moving through time with me in a different, more comforting way. So, as difficult as it was to close up that apartment where I lived with Ava, I feel I accomplished my goal in moving. But of course, the journey continues. If anyone has any news to share with the group or a poem or inspirational story (to potentially be included in a future newsletter if you wish), please email info@copefoundation.org.